You’re in search of an elusive kiwi. No, not the fruit. You wouldn’t have flown across the Pacific Ocean to eat a large berry. This kiwi, the national symbol of New Zealand, is a flightless bird. It’s the smallest type of ratite (think ostriches, emus, and cassowaries). It’s about the size of a chicken. It lays surprisingly large eggs, given its body size. It’s shy, monogamous, and nocturnal. And it’s endangered. But hopeuflly you’ll be able to spot one—at least one—on the Rakiura Track. The Rakiura Track is one of the New Zealand Great Walks, as well as one of the best opportunities to catch a glimpse of a kiwi. The 18-mile trail, which takes between one and three days to hike, follows the coastline, passes large bays, and crosses steep hills in Rakiura National Park. 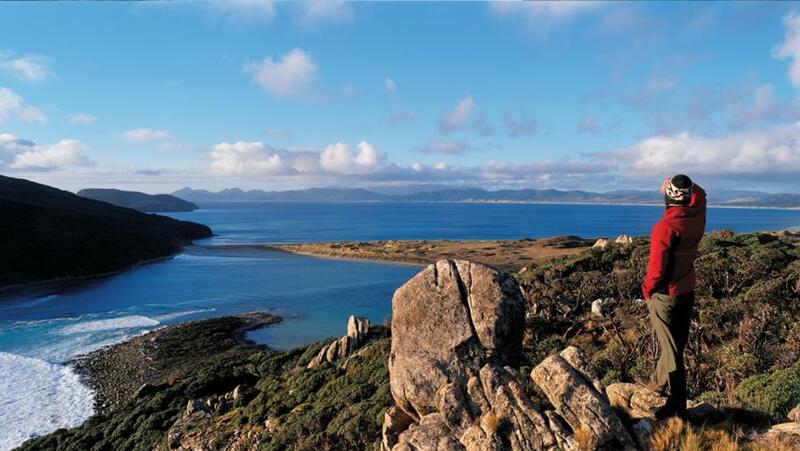 New Zealand’s newest national park—it only opened in 2002—covers 85 percent of Stewart Island. The country’s third-largest island sits 20 miles south of the South Island. It’s a great place for kiwis to hide. After arriving on Stewart Island—it’s only a short flight or a ferry ride across the Foveaux Strait—head to Lee Bay to begin tramping (you tramp, not hike, in New Zealand). A chain-link sculpture, symbolizing Stewart Island’s connection to the South Island, marks the entrance to the trail. It’s an easy walk from Lee Bay to Little River. The track follows the coast, extends over wooden footbridges, climbs through the bush, and descends onto Maori Beach. A short detour brings you to an historic sawmill, which operated at the beginning of the 20th century. The once-thriving community is long gone, but abandoned machinery and tram lines remain. The day ends at the Port William Hut near Magnetic Bay, where you fall asleep to the “morepork” call of owls. On the second day, you leave the beautiful coast to head up and inland. Pass through a regenerating podocarp forest. More old tracks, these used to transport milled trees, are underfoot. The forest becomes denser and more lush with rimu and kāmahi trees the farther you go. Stop at the lookout tower to take in the breathtaking view of Paterson Inlet and the Tin Range. Then the track descends into old Māori sites on Paterson Inlet’s shoreline. At the North Arm Hut, your home for the evening, you begin to get discouraged. With only one day left, you’ve yet to see, or even hear, a kiwi. The kākās, the silvereyes, and the kererūs you’ve seen along the way just aren’t the same. It isn’t until after you eat dinner and start to put out the campfire that a shrill “kee-wee” noise stops you in your tracks. When you finally hear the return “kurr kurr” sound of the female, you know for sure there are kiwis nearby. Instead of going inside to climb into your bunk bed, you sit outside on the green hut’s deck. The reddish-brown bird is bound to cross in front of you at some point, right? You’ve got all night—and a full moon—to find out.